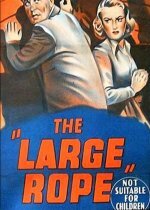 "The Long Rope" (1953) is a Britnoir and a good one. Donald Houston has served 3 years for an assault he didn't do. He returns to his small village wherein he is promptly accused of another murder that takes place. The villagers are supposed to be Brits who respect the rule of law. Forget that notion. Most of them are interested in rumor, gossip and acting upon accusation. They become quite the savage mob. The police in this movie become the barrier between an innocent man and mob injustice.